When we first heard that The Meg 2 was actually happening, it was said that the sequel was in the very early stages and while it is still early and we are a ways off from a release date, it sounds like there is work being done. As Lorenzo di Bonaventura told Sean, they are currently working on a script for the film and seemingly taking their time to get that right before moving forward. 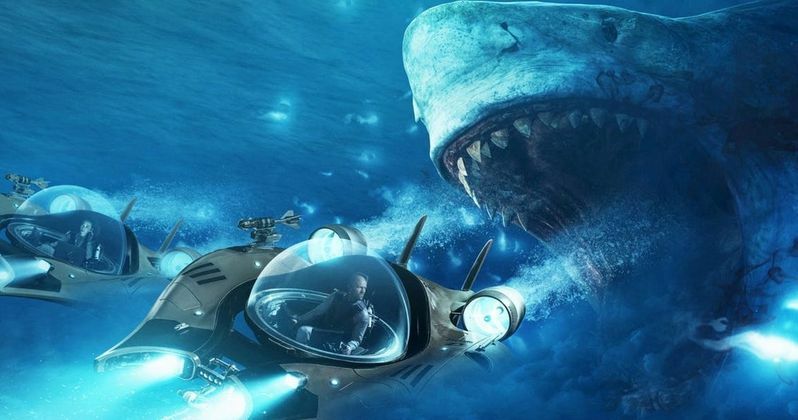 Lorenzo di Bonaventura did seem to hedge things a bit with “you never know,” seemingly not wanting to commit to anything firm on The Meg 2 until there is a script. There doesn’t seem to be a major rush and the focus at the moment is on getting that script and having it be good before the sequel moves to the next stage of development. But, it's encouraging to hear that the script is the primary driver of what happens next. The other thing that Lorenzo di Bonaventura expressed to Sean was gratitude about the first film’s success and that the audience last summer really embraced The Meg and what it was going for. I think when the film was announced and we began to see trailers for it, the tone wasn’t entirely clear. Some initially thought that The Meg was going to take a more serious approach than it ultimately did, but audiences, especially those internationally, really embraced it and showed up to have fun with a ridiculous giant shark movie that didn’t take itself seriously. Lorenzo di Bonaventura seems happy that the quintessential summer movie connected in that way. What’s interesting about this is that although the silly approach worked at the box office, it didn’t work for everyone. Some people would have preferred the bloodier, R-rated cut that director Jon Turteltaub teased. One person who seemed to lament the gorier, adult film The Meg could have been is actually the film’s star Jason Statham. As far as where a sequel could go, The Meg is based on a series of novels by Steve Alten and that could provide a pathway forward for the franchise. The sequels up the ante even more, introducing more creatures long though extinct that could delight summer audiences. Director Jon Turteltaub just wants to make sure that the franchise doesn’t turn into one with successively worse sequels where everything gets bigger, not better. it is refreshing to see a Movie made for fun, thrills, entertainment - not concerned with fears of social demonization. The Meg delivered, and audiences will have a repeat of the experience. Thank you for bringing back the magic of cinema.